Well I’ve been using my Dell UltraSharp UP2414Q for about 10 days now, and to say that it very nearly went back in the box is an understatement. But, I think I’ve found some sort of happy medium for now. Thanks to this article on Lifehacker about multiple monitors on Windows 7, I found a couple of useful bits of software and tricks (like how to locate the cursor with the control key). With the display scaled up, my most common applications (Office 2010, Chrome, NotePad++, Evernote) now look lovely. The biggest limitation it would appear is the graphics chipset in most laptops. I now realise that to get a worthwhile experience with very-high resolution screens, you need a dedicated high-end graphics card only found in a desktop PC. The Intel Iris and HD graphics chipsets found in Ultrabooks, the Intel NUC, Gigabyte Brix, and Apple Macs are only able to drive a maximum of three screens, including the laptop screen if you have one. 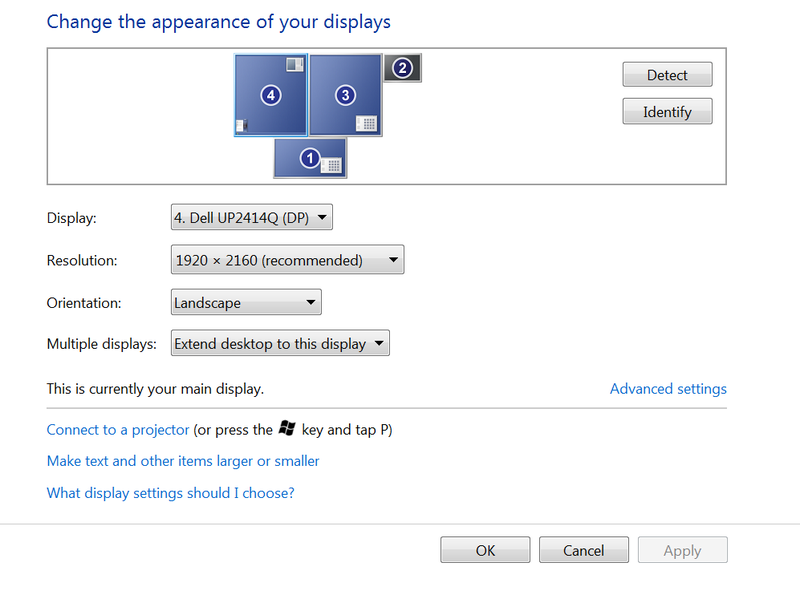 This is an issue as to drive a 3840×2160 screen @ 60Hz over a display port adaptor; you have to drive them as separate screens matched displayed as two 1920 x 2160 screen side by side. This basically robs me of one of my precious screens. If I drop to 30Hz (by disabling display port 1.2) I can use another screen at the of the refresh rate. However, after spending a couple of days @ 30Hz, I found it to be untenable; I was getting quite severe eye strain. A bit of a disappointment considering that I’ve spent better part of £500 on a screen to avoid precisely that. It would appear that once the display port 1.2 features are activated, I can’t use my passive DVI to HDMI cable to connect to my Samsung TV. I’ve just ordered a £20 Startech Active Adaptor, and will report on the results. Unfortunately, in this configuration, the laptop screen is next to useless. It has to sit below the UP2414Q, and with the 1080P screen resolution and the display scaling personalisation set to 150% (to offset the tiny, tiny, pixels), moving a “small” window into it makes it useless. So what was leftover from my last post? Well it turns out I’m an idiot (as if you didn’t know). I HAVE a Pro docking station; I only realised this when I pulled out the old one and realised that it had USB 3 connectors on the back. So one brand new docking station purchased for no reason. Doh. Whatever my troubles have been, they’ve not been down to me using a 1.1-only compatible docking station. See If I can find a better set of drivers from Intel, rather than Dell. Nope. The last set of official drivers for my Intel HD4400 cards are dated June 2014. Whilst the official Intel drivers have been updated since, they refuse to install. Although I could probably hack them into place, given that this is a work laptop that I rely on, I couldn’t really risk it. Still an option. The ideal scenario would be to use a 2nd UP2414P, but my graphics card won’t drive it. Going to try the Startech Active HDMI adaptor before I consider purchasing screen, probably a reconditioned U2414H 1080P screen. Unless you have a dedicated desktop rig AND a lot of real-estate for screens, I’d have to say no. The fact that the most common graphics chipsets can’t (IMV) adequately drive a 4k screen, and the stupid necessity of using two screens side-by-side, I’d wait until the technology goes through the next refresh cycle. The thing that’ll probably make the most difference is HDMI 2.0; as the spec allows driving a 4K screen @60Hz as a single screen. According to my current research, only a single display supports this, and it’s a 60+ inch TV, rather than a desktop monitor. Until the world moves on, unless you are REALLY keen on getting frustrated, I’d steer clear of 4k for now.